There is a critical need for improved methods for reconstruction of complex skeletal defects that involve missing bone tissue. These defects can occur because of congenital absence of normal bone or acquired bone loss due to cancer treatment or trauma. They remain one of the most significant challenges for surgeons. Currently, the best replacement for lost tissue is uninjured autologous tissue-healthy bone obtained from an uninjured location on the patient, which is harvested and transferred into the defect, and current clinical methods are effective for transferring this type of tissue.1However, these methods are limited by amounts of suitable bone tissue and resultant donor site morbidity. Tissue engineering has shown promise as a new source of tissues for reconstruction of these defects.2 Engineering living bone replacements in shapes and volumes relevant to clinical application could transform surgical practice. The successful translation of tissue engineering therapies into clinical application requires overcoming a number of technical, biological, and surgical challenges. Many bioreactor systems have been developed for building new tissues in vitro. A recent study showed the potential of using bioreactors to generate a large volume of engineered bone.3 However, the overall complexity of tissue formed is limited due to the inability to sufficiently recreate the process of vascularized bone formation. Other techniques attempt to regenerate bone within the defect site.4,5 For many clinical circumstances this strategy is unsuitable because the local tissues are compromised as part of the underlying disease process and, therefore, have limited healing and regenerative capacity. This necessitates generating the tissue at a healthy site distant from the defect and later transferring the tissue. Utilizing the body's own regenerative capacity to serve as an in vivo bioreactor to grow complex tissues overcomes many of the challenges of in vitro tissue engineering. 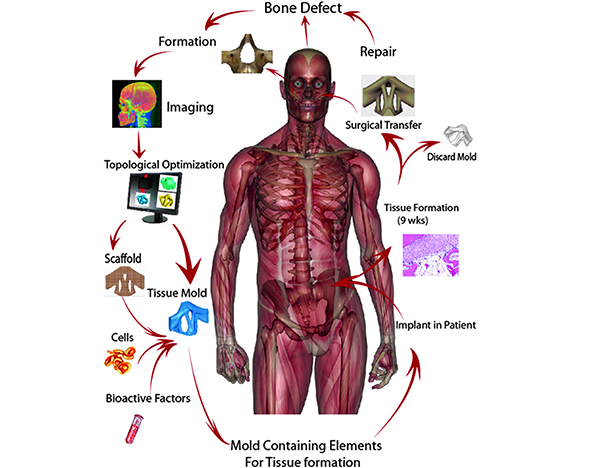 One strategy for bone tissue engineering is to exploit the natural osteogenic and angiogenic properties of the periosteum to serve as an in vivo bioreactor to enhance vascularized bone formation within implanted chambers of predetermined 3D shape.6,7 A presentation of the overall approach is provided in Figure 1. An image provides patient-specific information on the 3D structure of the defect to be reconstructed. The optimal structure needed for reconstruction is determined using computational models. Chambers are designed that specifically conform to the optimal structures determined. The chambers are filled with a tissue engineering strategy (e.g., scaffolds, cells, and growth factors) and implanted against the periosteum in a secure and stable location away from the defect site. After some optimal implantation time, the bone can be harvested and transferred along with the periosteum to the recipient location as a vascularized bone flap. The success of this approach requires determination of the tissue engineering strategies that can control the shape and volume of bone formed in the implanted chambers. Translatable large animal models of the periosteum-based in vivo bioreactor allow screening and optimization of these strategies. Small and large animal models have been developed to guide investigation into in vivo bone bioreactors. Small animal models result in relatively small tissue volumes.16,17 A critical limitation to clinical application is the inability to generate bone of sufficient volume to treat the defects encountered. In addition, the transport challenges presented do not sufficiently approximate the clinical situation. Therefore, large animal models are essential to test the feasibility of tissue engineering strategies for growing large complex volumes of bone. Large animals, including sheep, minipigs, and nonhuman primates, have been investigated in the field for bone reconstruction using an in vivo bioreactor strategy. While nonhuman primates offer a number of advantages,18 the high cost and strict regulations limit broad application. A preclinical model of an in vivo bioreactor should: (1) mimic the clinical surgery techniques; (2) allow evaluation of vascularized bone formation of large volume and complex shape; (3) have an implantation site with high regenerative capacity and low infection risk; (4) be adaptable for different tissue engineering components; (5) allow quantitative evaluation of results; and (6) be available/adaptable in a wide range of clinical research centers. Below, we review two periosteum guided in vivo bioreactor models, ovine and porcine, that meet these requirements. To access the the rest of this article and its references click here. Tissue Engineering, published by Mary Ann Liebert, Inc., a peer-reviewed journal, is the preeminent, biomedical journal advancing the field with cutting-edge research and applications on all aspects of tissue growth and regeneration. The above article was first published in the August 2018 issue of Tissue Engineering, Part B with the title "Large Animal Models of an In Vivo Bioreactor for Engineering Vascularized Bone". The views expressed here are those of the authors and are not necessarily those of Tissue Engineering, Mary Ann Liebert, Inc., publishers, or their affiliates. No endorsement of any entity or technology is implied.